July 23, 2014: If an asteroid big enough to knock modern civilization back to the 18th century appeared out of deep space and buzzed the Earth-Moon system, the near-miss would be instant worldwide headline news. Two years ago, Earth experienced a close shave just as perilous, but most newspapers didn't mention it. The "impactor" was an extreme solar storm, the most powerful in as much as 150+ years. "If it had hit, we would still be picking up the pieces," says Daniel Baker of the University of Colorado. 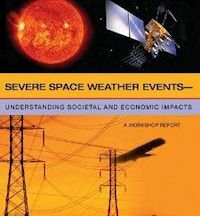 Baker, along with colleagues from NASA and other universities, published a seminal study of the storm in the December 2013 issue of the journal Space Weather. Their paper, entitled "A major solar eruptive event in July 2012," describes how a powerful coronal mass ejection (CME) tore through Earth orbit on July 23, 2012. Fortunately Earth wasn't there. Instead, the storm cloud hit the STEREO-A spacecraft. Extreme solar storms pose a threat to all forms of high-technology. They begin with an explosion--a "solar flare"—in the magnetic canopy of a sunspot. X-rays and extreme UV radiation reach Earth at light speed, ionizing the upper layers of our atmosphere; side-effects of this "solar EMP" include radio blackouts and GPS navigation errors. Minutes to hours later, the energetic particles arrive. Moving only slightly slower than light itself, electrons and protons accelerated by the blast can electrify satellites and damage their electronics. Then come the CMEs, billion-ton clouds of magnetized plasma that take a day or more to cross the Sun-Earth divide. Analysts believe that a direct hit by an extreme CME such as the one that missed Earth in July 2012 could cause widespread power blackouts, disabling everything that plugs into a wall socket. Most people wouldn't even be able to flush their toilet because urban water supplies largely rely on electric pumps. Before July 2012, when researchers talked about extreme solar storms their touchstone was the iconic Carrington Event of Sept. 1859, named after English astronomer Richard Carrington who actually saw the instigating flare with his own eyes. In the days that followed his observation, a series of powerful CMEs hit Earth head-on with a potency not felt before or since. Intense geomagnetic storms ignited Northern Lights as far south as Cuba and caused global telegraph lines to spark, setting fire to some telegraph offices and thus disabling the 'Victorian Internet." "In my view the July 2012 storm was in all respects at least as strong as the 1859 Carrington event," says Baker. "The only difference is, it missed." "Initially, I was quite surprised that the odds were so high, but the statistics appear to be correct," says Riley. "It is a sobering figure." In his study, Riley looked carefully at a parameter called Dst, short for "disturbance – storm time." This is a number calculated from magnetometer readings around the equator. Essentially, it measures how hard Earth's magnetic field shakes when a CME hits. The more negative Dst becomes, the worse the storm. Ordinary geomagnetic storms, which produce Northern Lights around the Arctic Circle, but otherwise do no harm, register Dst=-50 nT (nanoTesla). The worst geomagnetic storm of the Space Age, which knocked out power across Quebec in March 1989, registered Dst=-600 nT. Modern estimates of Dst for the Carrington Event itself range from -800 nT to a staggering -1750 nT. In their Dec. 2013 paper, Baker et al. estimated Dst for the July 2012 storm. 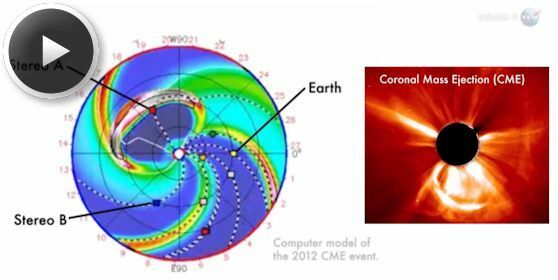 "If that CME had hit Earth, the resulting geomagnetic storm would have registered a Dst of -1200, comparable to the Carrington Event and twice as bad as the March 1989 Quebec blackout." "The rich data set obtained by STEREO far exceeded the relatively meagre observations that Carrington was able to make in the 19th century," notes Riley. "Thanks to STEREO-A we know a lot of about the magnetic structure of the CME, the kind of shock waves and energetic particles it produced, and perhaps most importantly of all, the number of CMEs that preceded it." It turns out that the active region responsible for producing the July 2012 storm didn't launch just one CME into space, but many. Some of those CMEs "plowed the road" for the superstorm. A paperin the March 2014 edition of Nature Communications by UC Berkeley space physicist Janet G. Luhmann and former postdoc Ying D. Liu describes the process: The July 23rd CME was actually two CMEs separated by only 10 to 15 minutes. This double-CME traveled through a region of space that had been cleared out by yet another CME four days earlier. As a result, the storm clouds were not decelerated as much as usual by their transit through the interplanetary medium. "It's likely that the Carrington event was also associated with multiple eruptions, and this may turn out to be a key requirement for extreme events," notes Riley. "In fact, it seems that extreme events may require an ideal combination of a number of key features to produce the 'perfect solar storm.'" "Pre-conditioning by multiple CMEs appears to be very important," agrees Baker. "Spacecraft such as the STEREO twins and the Solar and Heliospheric Observatory (a joint ESA/NASA mission) were designed to operate in the environment outside the Earth's magnetosphere, and that includes even quite intense, CME-related shocks," says Joe Gurman, the STEREO project scientist at the Goddard Space Flight Center. "To my knowledge, nothing serious happened to the spacecraft." "Inside Earth's magnetosphere, strong electric currents can be generated by a CME strike," he explains. "Out in interplanetary space, however, the ambient magnetic field is much weaker and so those dangerous currents are missing." In short, STEREO-A was in a good place to ride out the storm. "Without the kind of coverage afforded by the STEREO mission, we as a society might have been blissfully ignorant of this remarkable solar storm," notes Baker. "How many others of this scale have just happened to miss Earth and our space detection systems? This is a pressing question that needs answers." If Riley's work holds true, there is a 12% chance we will learn a lot more about extreme solar storms in the next 10 years—when one actually strikes Earth. Says Baker, "we need to be prepared."